Unified middleweight world titleholder Canelo Alvarez will fight Daniel Jacobs on May 4 -- Cinco de Mayo weekend -- the fighters announced Thursday. A venue has yet to be announced. However, the bout will likely take place at T-Mobile Arena in Las Vegas, where Alvarez has boxed in four of his last six fights. Golden Boy Promotions CEO Oscar De La Hoya, Alvarez's promoter, said last week on ESPN 97.5 in Houston that negotiations were underway to stage a trilogy bout between Alvarez and former champion Gennady Golovkin, whom Canelo defeated in September. It appears the talks were brief and unsuccessful, Canelo-Jacobs was announced less than a week later. "I'm happy to announce my next fight during the festive weekend of Cinco de Mayo," Alvarez said. "I will unify my middleweight titles against Daniel Jacobs on one of the two most important dates that belong to me. I have no doubt that I will be victorious and that I'll be one step away from becoming the undisputed middleweight world champion." In October, Alvarez signed a record-shattering five-year, 11-fight deal worth a minimum of $365 million with new sports streaming service DAZN, which launched in the United States in September. Canelo made his debut under the new deal on Dec. 15 by knocking out Rocky Fielding in a third-round stoppage to win a secondary super middleweight world title at Madison Square Garden in New York City. The fight also served as Canelo's first bout at the famed venue. 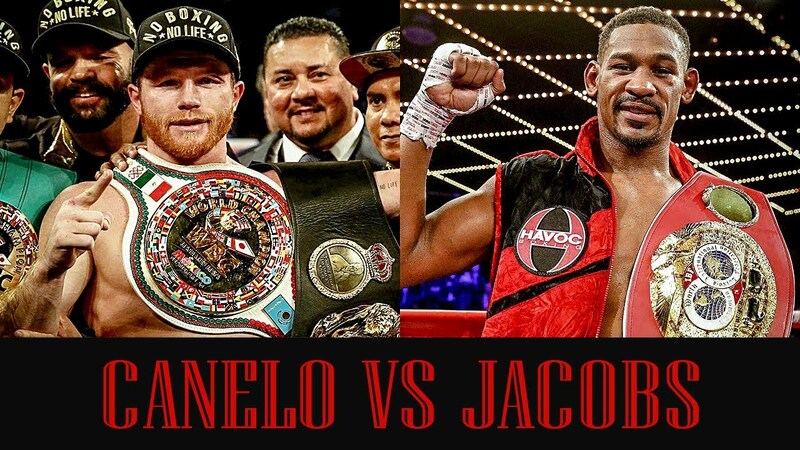 While Alvarez (51-1-2, 35 KOs), 28, hinted about having fights between the 160 and 168-pound divisions, he decided to return to middleweight to face Jacobs, who like Canelo, left HBO after the network exited boxing after 45 years. "Canelo Alvarez wants the best fights and the biggest challenges," said Golden Boy Promotions CEO Oscar De La Hoya, Alvarez's promoter. "That's what he did as the 154-pound champion, and that's what he's doing now as the king of the middleweight division. We are also proud to demonstrate to boxing fans that this new partnership with DAZN means that fans will get pay-per-view level fights without the cost of pay-per-view. Golden Boy Promotions is continuing its promise to make the sport as accessible as possible by putting this champion-vs.-champion fight on the platform." Jacobs (35-2, 29 KOs), 31 of Brooklyn, who survived a bout with osteosarcoma, won a vacant middleweight world title by split decision against Sergiy Derevyanchenko in a scintillating affair on Oct. 27 at the Hulu Theater at Madison Square Garden. He called out Alvarez following his win. Now he has his shot at winning what would be the most significant bout of his 13-year career. "This is the opportunity I have been waiting for. The opportunity to achieve greatness inside the ring," Jacobs, a four-time New York Golden Gloves champion, stated. "I have always believed I can beat Canelo, and on May 4 live on DAZN, I will get my chance to play it out. It's been nearly four years since Canelo has faced an American challenger. It's going to be a huge event where I believe I will cement myself as the best middleweight in the division."